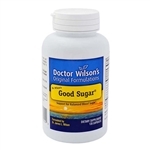 Doctor Wilson’s Original Formulations brand supplements are used and trusted by over 1,500 pharmacies and healthcare providers around the world. In addition to vitamin and herbal supplements for adrenal fatigue, Dr. Wilson has created formulas for stress, adrenal fatigue, immune support, blood sugar health, and more. We strongly believe in the effectiveness of our products and offer a 90 day unconditional guarantee on every order. Discover why our products are different and recommend them to your local pharmacy or healthcare provider.